Hello, I am wondering if anyone can help me identify where this tongue scraper was made. It appears to be silver, but has no hallmarks. It is decorated with various designs which made me think likely Mexican or South American. I am also curious if anyone has any idea how old it is. The pusher is not exclusively a Native American, nor even an American, implement. Pushers are frequently seen in combination with a spoon making up a christening set. They are meant to be used by the child her/himself to manoeuvre food onto the spoon. Right,children food pushers were common throughout Europe since late Victorian era when it was considered rude even for children to touch food with hands. Kids were given food pushers to help them rake their dinner onto forks and spoons. Thank you very much for your responses. The information was very helpful. What a strange utensil, the Victorians had such a wide range of one purpose tools. Thanks! "AUTHENTIC NAVAJO INGOT SILVER CLUSTER UNUSUAL SATELLITE DESIGN. Fold marks are not indentations in the silver, but sometimes you will see these "ghost-like-lines" in the silver, and these are the fold-marks, they are kind of like "stretch marks" on our skin, that is really the best way to describe them, they are difficult to see and they appear as very faint, asymmetrical streaks, more like a very subtle discoloration in the silver which appear in the silver. When I read through my Native American Silver books, I will try to get a better description of these "fold marks" or "ingot stamping marks." 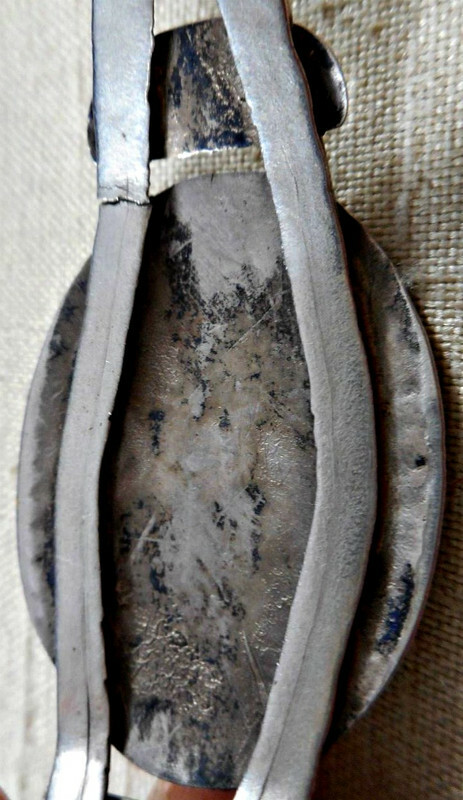 Suspect you would have a hard time finding a silversmith, Navajo or otherwise, who "turned and folded a silver ingot over and over again" while pounding out a spoon or any other item - that just isn't the way it's done. The flaws seen in hand-wrought Navajo silver can be caused by working too cold, resulting in cracks, or an improperly poured ingot can have air bubbles exposed when hammering or rolling, and overheating during annealing can cause brittleness, splitting, changes in color and texture, even melting. To date a piece by flaws in workmanship doesn't seem realistic to me, there are numerous (would guess the majority) early Navajo pieces without those flaws, likely done by more experienced and/or skilled smiths, and there are also numerous later hand-wrought pieces that show considerable flaws - I have a Navajo chip-inlay buckle that would date no earlier than the late 1960s-early '70s, and it shows all sorts of flaws on the reverse. 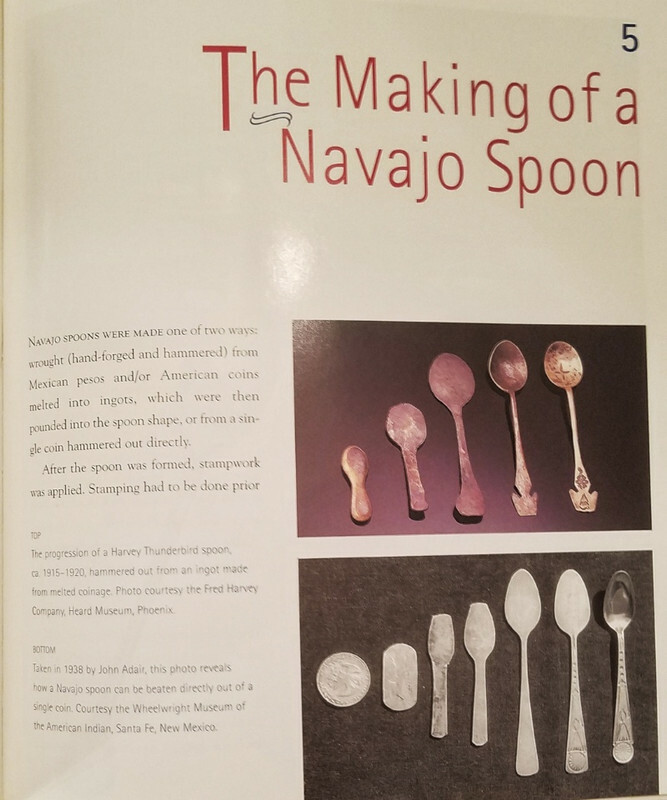 Most of my books are packed away and Kline's 'Navajo Spoons' is the only one handy at the moment, but I do have a couple of others, and am sure that Adair's 'Navajo and Pueblo Silversmiths', an older text-heavy book, describes their process of hammering silver pieces in detail. So perhaps the "Fold Marks" are simply artifacts from the Ingot itself, which was created by melting down coins? Just out of curiosity, I do recall a depiction (photo or print) of a Southwest native jeweler or smith sitting on the ground and using a section of cut steel rail for his entire workbench. Would they have regularly hammered their silver out on such a simple set-up in the old days? Could this be related to the unusual lines or waves in the metal? Those are fascinating photos Cheryl, It is quite amazing what can be made from a coin by a skilled craftsperson. Thanks for your posts.